MIAMI | The archdiocesan Office of Black Catholic Ministry invites the community to its annual revival, Feb. 17, 18 and 19 at three local parishes. The revival consists of three evenings of praise and worship, hospitality, and inspiring and uplifting sermons. 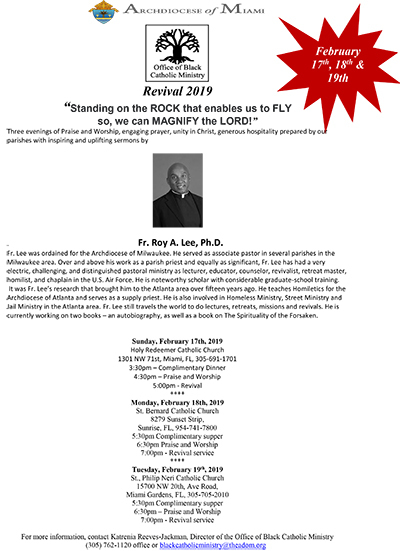 The theme this year is “Standing on the ROCK that enables us to FLY so, we can MAGNIFY the LORD!” The speaker will be Father Roy A. Lee of the Archdiocese of Milwaukee. Father Lee has served as associate pastor in several parishes in the Milwaukee area. He also has a distinguished history as lecturer, educator, counselor, revivalist, retreat master, homilist, and chaplain in the U.S. Air Force. His research brought him to the Atlanta area over 15 years ago, where he teaches homiletics for the Archdiocese of Atlanta. He is also involved in homeless ministry, street ministry and jail ministry in the Atlanta area. And he is currently working on two books – an autobiography as well as a book on The Spirituality of the Forsaken. Sunday, Feb. 17, at Holy Redeemer Church, 1301 N.W. 71 St. Miami. The evening will begain at 3:30 p.m. with a complimentary dinner, followed by praise and worship at 4:30 p.m.and the revival service at 5 p.m.
Monday, Feb. 18, at St. Bernard Church, 8279 Sunset Strip,Sunrise; complimentary supper at 5:30 p.m., praise and worship at 6:30 p.m. and revival service at 7 p.m.
Tuesday, Feb. 19, at St. Philip Neri Church, 15700 N.W. 20 Ave. Road, Miami Gardens; complimentary supper at 5:30 p.m.; praise and worship at 6:30 p.m.; and revival service at 7 p.m.
For more information, contact Katrenia Reeves-Jackman, director of the Office of Black Catholic Ministry, at 305-762-1120 or blackcatholicministry@theadom.org.